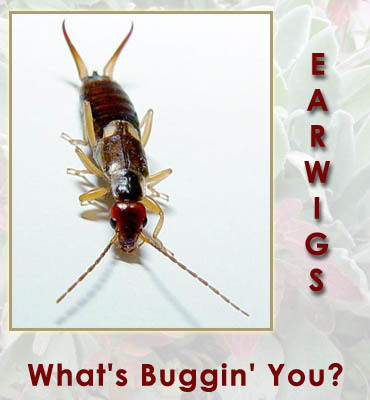 Earwigs are the brownish/black insects (about Â¾ inch long) with pointed pincers on the rear of their abdomens. The earwig’s lifelong pursuit is to be an active member of the insect cleanup crew of the garden. They chew up plant debris and turn it into humus. For this job, earwigs are considered a beneficial insect. You rarely see this insect out in the open, but rather under leaves, under low growing foliage plants or in a woodpile. Creating humus is part of the earwig “career” that is a positive thing for any garden. However, they also have a liking for new tender foliage and this is what gets them into trouble with gardeners. When they eat tender foliage, they are considered a pest. There are a number of different earwig management techniques. The earwig likes dark, damp places in the yard. In these locations, place rolled up newspapers or low-sided cans coated with oil. The earwigs will crawl inside of either of these traps, and you can simply throw them away. If, however, you have an infestation of earwigs eating too much of the new foliage, you may find it necessary to apply an earwig bait. A follow up application two weeks later usually takes care of any stragglers. Ultimately, the best way to prevent earwig infestations is to keep the garden clean and remove potential earwig hiding spots. A few here and there are more helpful than harmful to your gardens, but if they’re making a meal out of your prized plants don’t hesitate to pull out the bait!